The formation of a new lodge was mooted in 1970. Discussions took place between several individuals but the main movers were W Bro Thomas John Jenkins (better known as Jack) who became the first Master, W Bro Henry Dennis Bartley, the first (Acting) Immediate Past Master and W Bro Glyndwr Harris Richards the first Senior Warden of the new lodge. They were all from St Mildreds Lodge No 5078. They were joined by W Bro Donald Thomas Richmond of Carmel Lodge No 4774 who became the first Secretary, W Bro Charles Kitchener Manley of the Lodge of Amity No 5823 who became the first Director of Ceremonies and several other Master Masons from various other lodges who went on to become officers in the inaugural ceremony. Discussions continued throughout the year and the final arrangements were made at a meeting held in the Globe Hotel in Cardiff on the 8th of October 1970. By this time agreement had been reached that the name of the new lodge should be Croeso. The application was duly sent to the Provincial Grand Secretary on the 20th of January 1971 with the following proposed objectives. To further the principles of Freemasonry in general and particularily in this Province. To enable Master Masons to progress to the Chair of King Solomon in a reasonable time. As friendship is such a vital Masonic principle a small lodge would enable all the Brethren to know each other and thus promote goodwill. The Founders resolved to strive for quality in the ceremonies, quality at the festive board and above all to offer a quality welcome to the visitors. Hence the name of the Lodge “Croeso” being the word in Welsh for “Welcome” it was hoped it would reflect one of the most important Principles of Freemasonry, that of Friendship. The Welsh influence continues in the design of the Lodge Crest which shows the name of the lodge together with the traditional Square and Compasses over a depiction of the Welsh Dragon. 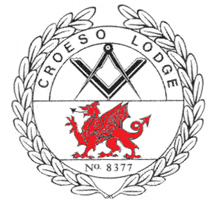 Happily the application was accepted and on the 23rd of June 1971 Croeso Lodge No 8377 was consecrated by the then Provincial Grand Master, the Rt W Bro The Lord Swansea and his Officers who installed W Bro Thomas John Jenkins as the Founder Master. At the beginning there were 24 members. That increased steadily (44 in 1981) to 50 members in 1992 on the occasion of the 21st Anniversary of Croeso. To celebrate it was decided to hold a ceremony where the surviving Founder Members who were still active and regular participants in the life of the lodge would be presented with a token of the members gratitude. They became known as Founders Rings and remain the property of Croeso to be passed on to Past Masters in order of seniority, who are still active and regular participants in the life of the lodge. As a result when W Bro T J Jenkins passed on in January 1994 his ring was presented to W Bro Gary Frederick Cooper, who was initiated in 1973 and was the first initiate to attain the Chair of King Solomon (in 1979). Similarily when W Bro G H Richards died in February 1994 his ring was passed on to W Bro Malcolm Harry Argyle who was initiated in 1975, went through the Chair in 1982, and was the DC for many years. When W Bro C K Manley died in February 1996 his ring was passed on to W Bro Colstan Arthur Hicks who was initiated in 1977, went through the Chair after Malcolm in 1983, and was the Chaplain in later years retiring in 2006. And as a result of further resignations and deaths, five rings were conveyed to new custodians, on the 15th of November 2013. The first was presented to W Bro Roger Francis Richmond, who was Master of Croeso in 1990, and in 2005 became the first and only member of the lodge to be appointed a Grand Lodge Officer. Very active in Provincial Grand Lodge he was most notably the Secretary of the 2010 Charity Festival. Roger, very poignantly, received the ring of his late Father W Bro Don Richmond. The second ring went to W Bro Lionel Barry Cozens who was Master of Croeso in 1994 and again in 2007. Barry is Charity Steward and continues to offer advice and encouragement. Barry received the ring of his old friend the late W Bro Frank Griffiths. The third ring which once belonged to the late W Bro Eric Cross went to W Bro David Cross (no relation). David went through the Chair in 1995 and can always be called on to breach the gap or cover for emergencies. The fourth ring was presented to W Bro Giles Patrick Day who was Master in 1998 and again in 2011. Giles is now Treasurer and was another that the lodge has been fortunate to have that was prepared to step in if asked. Giles received the ring of the late W Bro Vivian Hill. And finally W Bro Lyndon Gordon Pugh who was Master of Croeso in 2000 and again in 2001 received the ring of W Bro Colston Arthur Hicks. Lyndon was Treasurer for 5 years prior to the present incumbent and continues to support the lodge in any way that he can. One tradition that continued for many years was that the Master of St Mildred, the Mother Lodge of Croeso, was invited as a non paying guest to attend the Installation of each new Master of Croeso, which was normally reciprocated by St Mildred. Unfortunately St Mildred No 5078 surrendered its warrant on the 1st of September 2011. Some of their Lodge artifacts and regalia were donated to Croeso. Over the years Croeso has enjoyed good attendance by members and guests. The records can be seen and analysed as Freemasons are reknowned for their organisation and especially their book keeping. As stated earlier the lodge started with 24 in 1971, went to 44 in 1981 and had 50 in 1992. In 2006 the numbers had fallen to 37 and there was some concern at the trend. However, since then, the lodge has been initiating candidates at a good rate and together with some joining members has seen the membership increase steadily to 50 in 2012. And trying not to count your chickens before they are hatched, all further indications show that the odds are in favour to increase the numbers further over the coming years. As the senior Past Master W Bro Malcolm Argyle often states the lodge is a dining lodge. The fact that the lodge meets on a Friday night is no coincidence. It is the end of the normal working week, so members are able to relax a little. The subscription includes dining as well as wine and spirits. So even more reason to relax and enjoy themselves. W Bro Gary Cooper, another senior Past Master will add that after a good ceremony, standards should be maintained at the after proceedings. Good food, good fellowship and good humour is expected, and above all, that brevity is essential. There is no doubt that a Masonic Lodge provides a safe and usually stylish place to enjoy the company of others of a like minded nature. The initial cost can be restrictive but once established it is no more expensive than the average golf club.